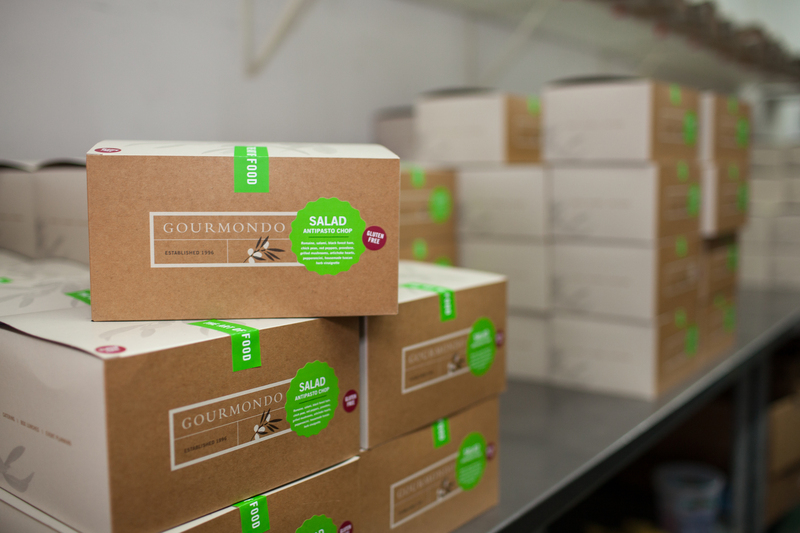 As one of the longest-standing and (in our humble opinion) best Seattle catering companies, Gourmondo places a lot of emphasis on freshness. We seek out the freshest, local ingredients and continually infuse our menus with creative, new flavors. Last year, we discovered that freshness plays an important role in branding, as well: a brand refresh can lead to sales growth, a better customer experience, and an increase in overall awareness. Since these are facts from which all kinds of businesses can benefit, we thought we’d break it down for you here on our Business of Food blog. Gourmondo’s brand refresh was initially inspired by our 20th anniversary in August 2016. We still can’t believe it’s been 20 years since our founder Alissa Leinonen started Gourmondo as a 470 square-foot café in the Pike Place Market. Since then, we’ve grown not only our boxed lunch business, but also added social and event catering, developed a line of retail salad dressings and launched a new Cafés Division, where we operate healthy grab-and-go café concepts for mid to large-sized companies and their employees. 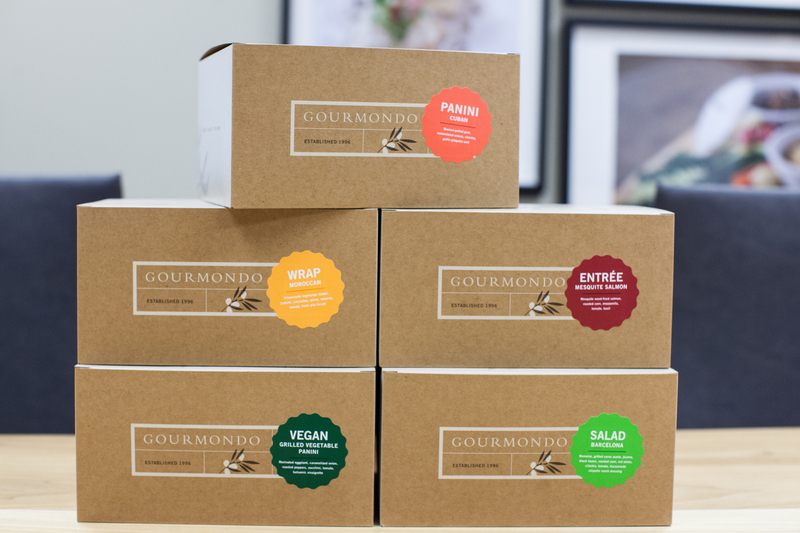 As we faced our big milestone and delved deeper, we realized that while our brand had continually evolved in terms of our food offerings and customer service, we had not moved Gourmondo’s aesthetic look and feel forward. It was time for a refresh! Since we send out more than 8,000 branded boxes a month to more than 150 Seattle and Eastside businesses, our first step was to address boxed lunch packaging. In early September 2016, with the help of Seattle branding agency States of Matter, we introduced our new look: larger boxes to comfortably accommodate more product and colorful labels for each box lunch category for easier organization and eye-catching appeal. Additionally, we designed an entirely new box lunch category called The Giving Box - a “black box” in honor of our chef, Tom Black and featuring a Chef’s Choice seasonal menu item. A portion of the proceeds of each Giving Box sold goes to a local non-profit. Since October 2016, that organization has been YouthCare. 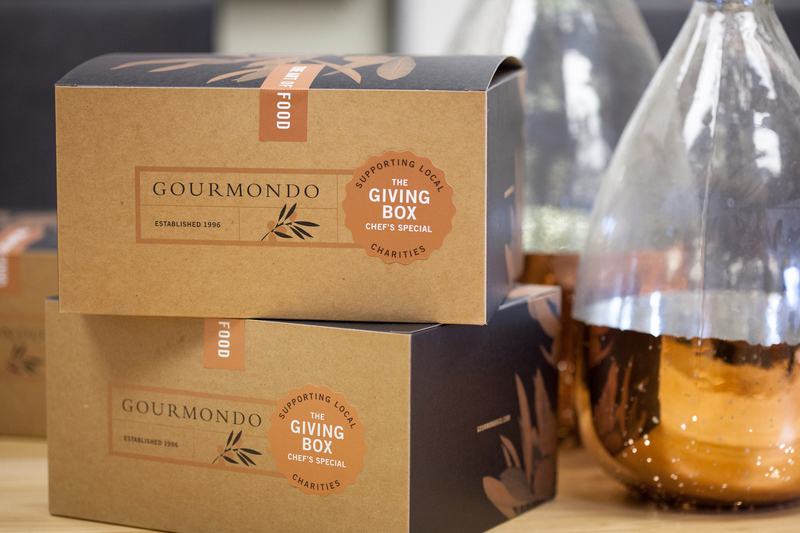 The Giving Box, a new box lunch category to benefit local non-profits. To celebrate our revamped packaging, we also spiced up our menus with new and more intriguing items, including two tasty vegetarian sandwiches: the Grilled Portobello Panini, and a delicious Vegetarian Bahn Mi Panini inspired by Seattle’s Vietnamese community. Next, we enhanced Gourmondo’s website. Recognizing that our site needed to provide a better customer experience, both functionally and aesthetically, we made it more intuitive and visual, while also making it easier to view options and to order. Since its launch at the end of September 2016, we have seen a significant uptick in web traffic and transactions. On the catering side, our uniforms and buffet layouts were revamped. Unlike the monochrome black shirt, slacks, and apron uniform that nearly every catering company uses, our employees stand out in their sophisticated, contemporary gingham check shirts (black for men, blue for women) and vests. We also updated our buffet layouts to be more functional and visually appealing. 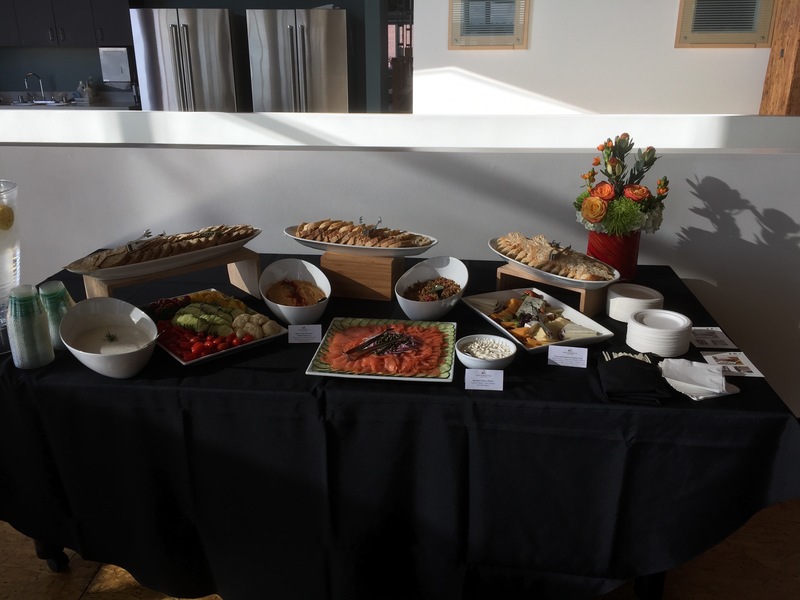 These modern riser systems and platters elevate the buffet’s presentation while continuing to put the food at center stage. The result? 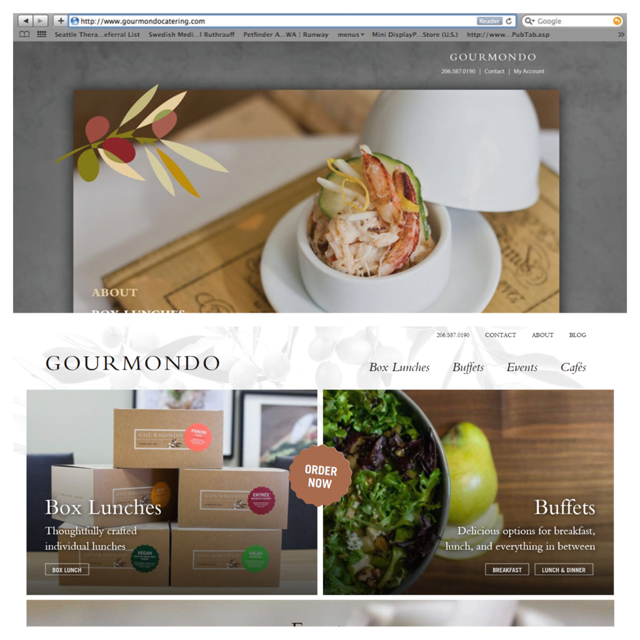 Gourmondo’s new packaging and website, along with the changes we made to our menus and catering uniforms and layouts, contributed to a 30+% boost in sales within the first six months. Turns out that investing in brand isn’t just a trend – it is an important tool to help to grow your business. 1. Regular investment in brand will pay off. When we first refreshed in 2001, we saw an immediate jump in sales. This same jump occurred after our 2016 refresh. This proves it is crucial to continually invest in your brand—which is why Gourmondo has committed to a brand refresh every 5 years moving forward. 2. Apply the same attention to brand as you do product—and vice versa. We always believed in continually innovating our food and service to stay relevant in the competitive Seattle catering market. Now, we understand we must implement this same inventiveness with our brand. When done thoughtfully, the results are priceless. 3. Evolution not reinvention. When refreshing your brand, it is important to “evolve” not “reinvent.” Customers must still be able to identify with your company’s look and feel—evolution is not a new company, but your company made more relevant and modern. Remember that this evolution should not just focus on aesthetics but also on creating a better customer experience.